Starring the voices of Zach Callison, George Newbern, Jerry O’Connell, James Garner, Arnold Vosloo. 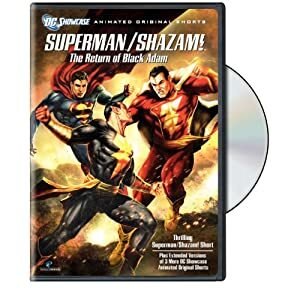 Presented in the gritty 1970s style of previous DC Showcase shorts, young Billy Batson accepts the mantle of Captain Marvel, Earth’s mightiest mortal, just in time to battle his corrupted counterpart, Black Adam, with a little help from Superman. The main feature is a fine morality play. Vulnerable to magic, Superman needs Billy’s help to defeat Black Adam, but once granted powers of his own, will bullied orphan Billy remain pure-hearted? This release also collects and offers audio commentary on the Spectre, Jonah Hex, and Green Arrow shorts previously available respectively on Justice League: Crisis on Two Earths, Batman: Under The Red Hood, and Superman/Batman: Apocalypse. Joe R. Lansdale’s commentary on Jonah Hex was the most interesting to me as a crime fiction reader. Finally, there are four episodes of DCU animated series giving further background on Captain Marvel, The Spectre, Green Arrow, and Jonah Hex. While all the episodes represent the heroes well, “Chill of the Night” from Batman: The Brave and The Bold, stands out. As Batman learns the identity of his parents killer, the vengeful Spectre and benevolent Phantom Stranger wager on The Dark Knight’s ultimate fate. Previous Batman actors Adam West and Kevin Conroy voice important roles. This is the perfect purchase if you’re more a fan of cult heroes than marquee names.